Up at 8:00 a.m., we grabbed a cup of coffee at the hotel restaurant and headed to the meeting point for the Historic Cave Tour. 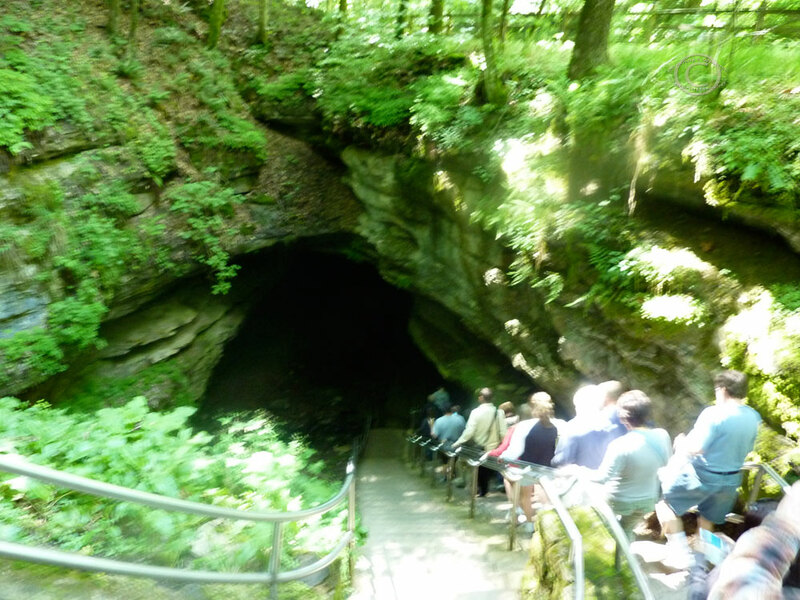 This tour provides visitors with a history of the cave as well as a chance to see some of Mammoth Cave’s wonders. Combining the information I remember from the tour and information from the National Park Service’s A Brief History of Mammoth Cave, I will try my best to give a succinct and accurate history. Long mined for sparkling crystals and minerals like gypsum, Mammoth Cave has revealed thousands of artifacts that confirm the presence of man up to 4,000 years ago. It is unknown exactly what Native American tribes did with the glimmering prizes unearthed within the caves, though it is clear areas of the cave were repeatedly explored and utilized. The story of the European discovery of the cave involves a name named John Houchins and an irritated black bear. According to legend, at the turn of the 19th Century, Houchins shot a black bear while hunting. His efforts were unsuccessful and he proceeded to chase the bear into the woods. It was this fleeing bear that lead Houchins to the entrance of Mammoth Cave. The records of who “owned” the cave vary making the human-related circumstances of the cave unclear until around 1812. Mammoth Cave and Dixon Cave are both known as “petre caves” due to the existence of calcium nitrate in the soil. Calcium nitrate, otherwise known as nitre, is a by-product of nitrogen fixing bacteria. Nitre can be transformed into potassium nitrate, or “saltpetre” which when combined with sulfur and charcoal creates black gunpowder. When this existence of nitre was realized, the commodity-driven interest of man was solidified. On July 9th, 1812, Hyman Grast and Charles Wilkins won the biding war for the rights to the cave. Soon after realizing its tremendous commercial worth, they set 70 slaves to begin building the equipment that would remove the nitre from the ground. The slaves built the equipment, mined the nitre, transported it to the surface, and also carried out the process of creating the saltpetre before shipping the substance to the newly formed DuPont chemical company in Delaware. Since during the War of 1812 one British strategy was to cut American access to foreign supplies like gunpowder, Mammoth Cave and Dixon Cave provided much needed raw materials. The Historic Tour winds through a section of Mammoth Cave where remnants of the original saltpetre mining equipment still stands today. Remnants of mining hidden in shadows of Mammoth Cave. Photo by DRJ. The combination of two violent earthquakes in 1811 and 1812 likely damaging the mining operation and the decline in the need for gunpowder after the war led to the abandonment of the mining project. 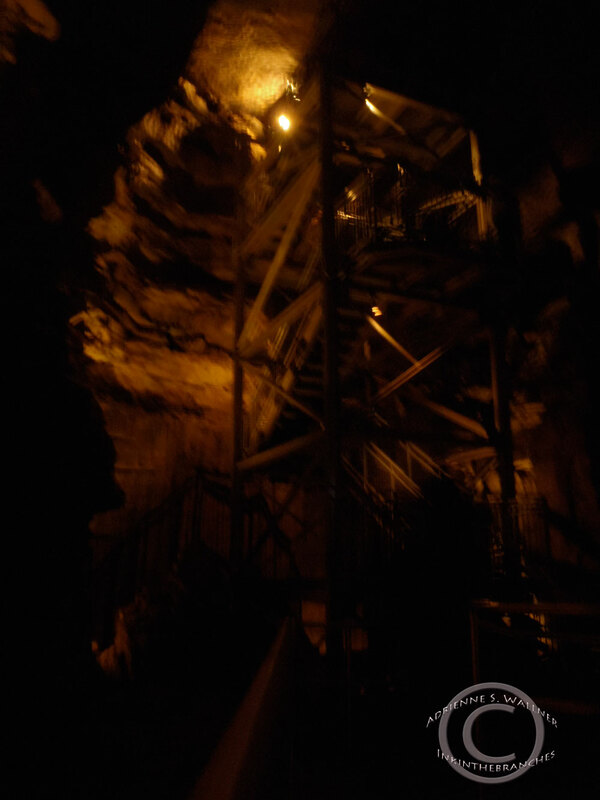 But Mammoth Cave had gained some notoriety by this point and people became curious. Caretakers were hired to give tours to public while one particular room was used for a very specific purpose. In 1830, the son of one of the caretakers began utilizing part of the cave as a church. 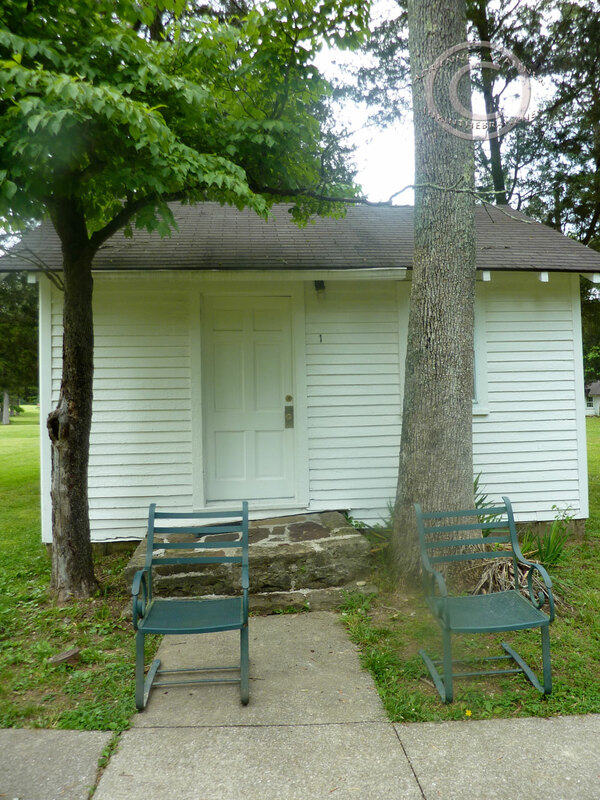 George Gatewood led his congregation underground, through the dark cave passages to a room furnished with log benches. After collecting all of the parishioners’ lanterns, the young ministes lined them up on a stone ledge like footlights, and then climbed to “Pulpit Rock” to deliver his sermons. The Historic Tour includes a stop in the very room where these services took place and a chance to sit on the log benches while the tour guide tells the story of this subterranean worship. As years passed, public interest in the cave dwindled and Hyman Gratz ended up selling the cave property to Franklin Gorin for $5,000. Gorin saw at once that Mammoth Cave was ripe for the tourist trade. He instated a group of official cave guides, one of which was 17-year-old slave, Stephen Bishop. 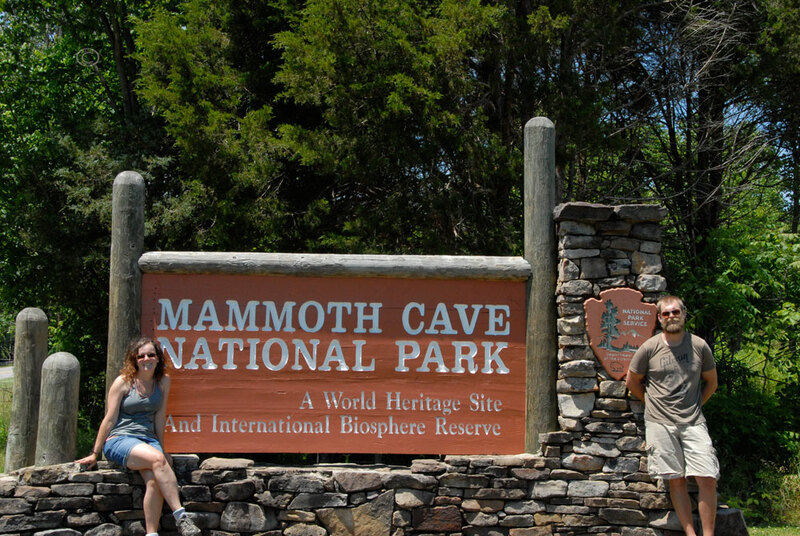 Bishop become one of the most popular and most experienced guides of Mammoth Cave. In 1839, Gorin was forced to sell Mammoth to Dr. John Croghan because of financial strain. Croghan instantly recognized Bishop’s abilities and allowed him freedom to explore the cave. In his explorations he was the first to cross the Bottomless Pit, he discovered Echo River and Roaring River, and in 1840 discovered the Mammoth Dome. The stop in Mammoth Dome is one of the most extraordinary parts of the Historic Tour. At 192 feet high, Mammoth Dome is just that – MAMMOTH. You can’t help but crook you head back as your jaw hangs open and utter a long, draw-out “Wooooow”. The history of Mammoth Cave is filled with many singular tales. The story of the new owner, Dr. John Croghan is no exception. Dr. Croghan had learned about Mammoth Cave by reading about the varying items including bats, timber, and bodies of Native Americans, which had by some unknown natural means been preserved in the cave. Croghan decided that it must be something in the cave air. Specializing in “pulmonary consumption” or tuberculosis, Croghan was caring for 16 patients in the winter of 1842-1843. In a desperate attempt to sooth or possibly treat his sick charges, he sent his slaves to build small hut sin the caves intended to house patients. His idea was that the patients would “take the airs” and perhaps it would have a positive effect on their health. Tours continued while the tuberculosis patients resided in Mammoth Cave. As tourists hiked down the paths, patients shuffled through the shadows. Initially, patients claimed to feel better. But after time, the cold damp cave air along with the smoke from heating and cooking fires damaged the patients’ sick lungs irrevocably. Five patients died in the cave. The Historic Tour passed “Corpse Rock”, the long, flat stone upon which the bodies were laid. The cave sanitarium was closed in 1843. Can you imagine “taking the air” here? Other interesting tales the tour guide shared during the Historic Tour include stories about the cave being used as an entertainment venue. From sax and horn bands, to strings bands, to local singers, visitors to Mammoth Cave were entertained underground into the early 21st century. The Historic Tour also passes an area that shows what visitors and cave explores did to record their visit before this was a protected National Park. 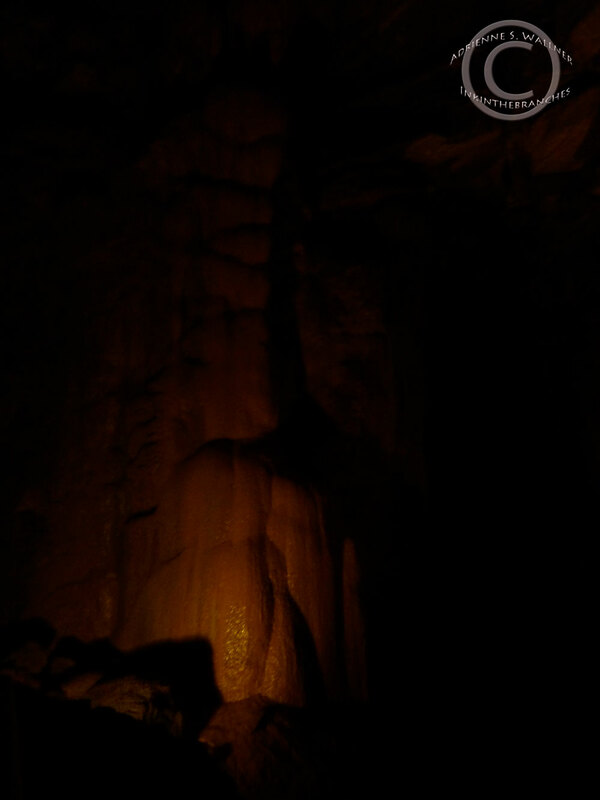 While exploring the caves, the use of a lamp was of course necessary. 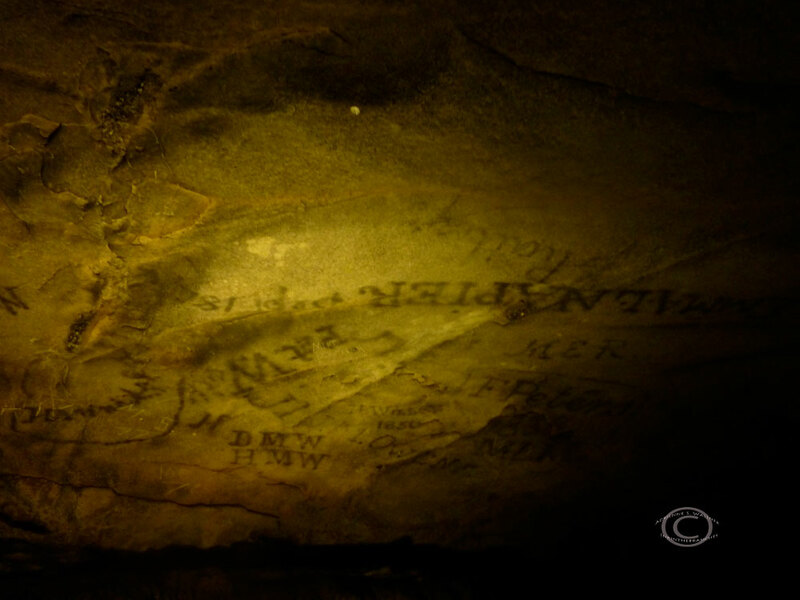 The cavers used grease-oil lamps to burn their names and initials into the ceiling of the cave. Other highlights of the Historic Tour include a squeeze through Stephen Bishop’s Fat Man’s Misery. About four feet tall and only about a foot wide at the broadest point, the cave passage is just that. It is necessary to turn sideways in many spots, as well as to duck beneath several feet of low stone ceiling. This section may be unpleasant for anyone who is claustrophobic. Me in the tight squeeze! 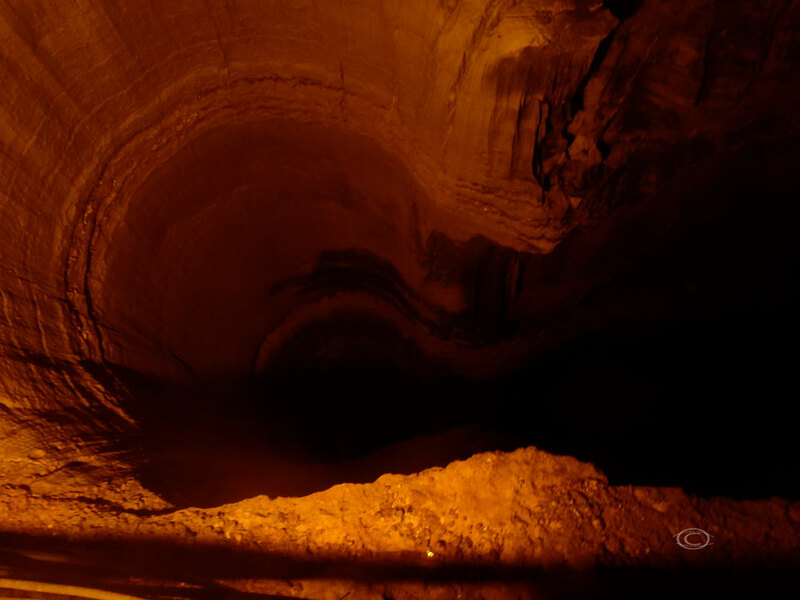 The Bottomless Pit, first crossed by Bishop, is also a stop on this tour. The incredible power of water to dissolve limestone is dramatically displayed by this seemingly endless black void. It drops 105 feet into the deep darkness of the Earth. The tour route brings everyone right to the precipice. A 63-foot high dome then caps this seemingly endless void. Bottomless Pit. 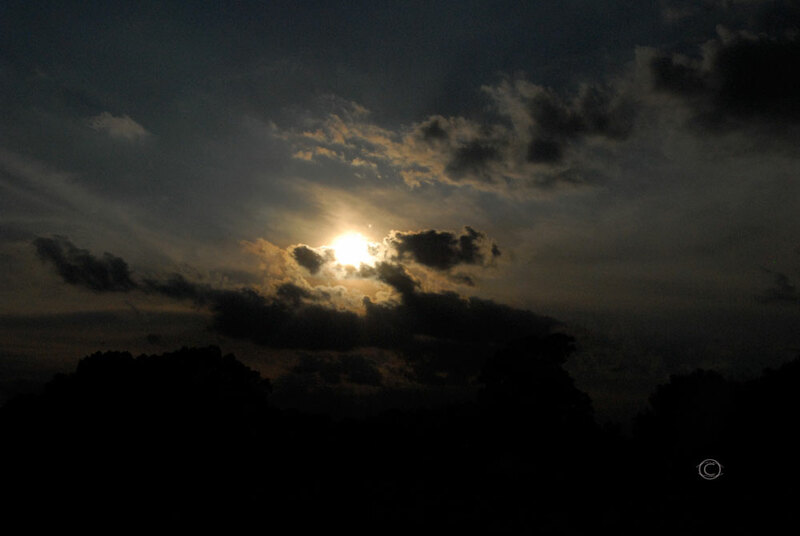 – Photo by DRJ. Afterwards the Historic Tour, we headed back to our cottage to pack and check out. It was a sunny and warm Kentucky morning. 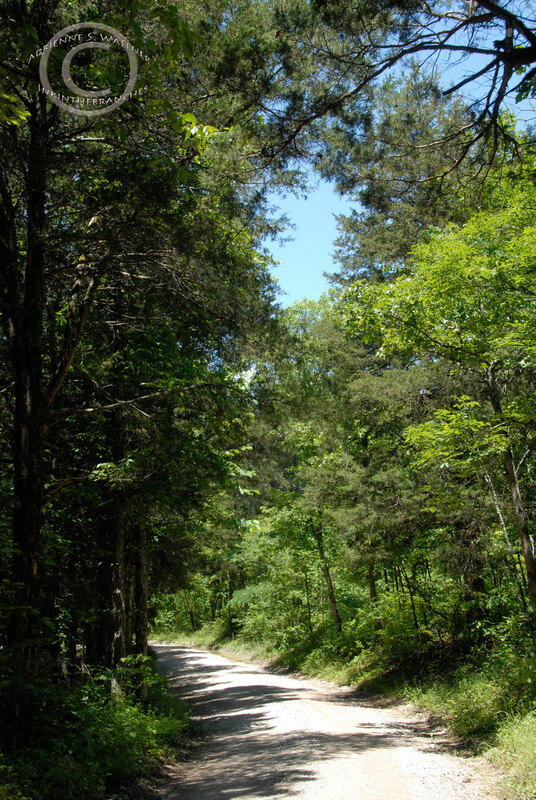 We followed Flint Ridge Road the north side of Mammoth Cave National Park to explore the banks of the Green River. 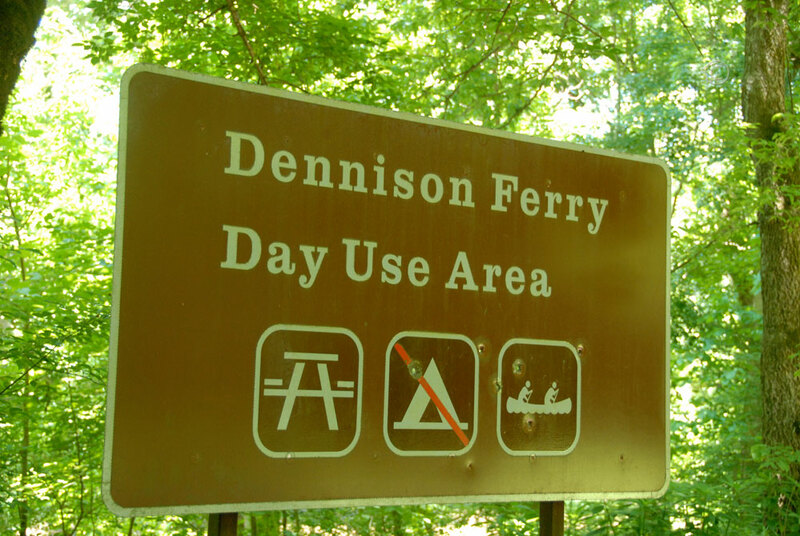 Mike had informed us that a state fishing license was not required for fishing in the Green or Nolin River as long as we stayed within the park boundaries and we had come prepared. 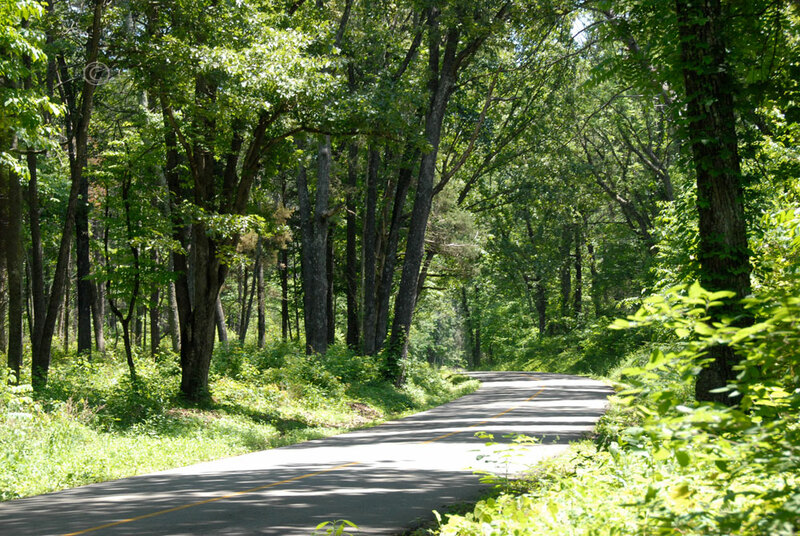 We cruised along Flint Ridge Road to the boarder of the park, and then turned on Dennison Ferry Road. A dirt road the heads west back into the park, Dennison Ferry Road leads at a canoe launch and picnic area. 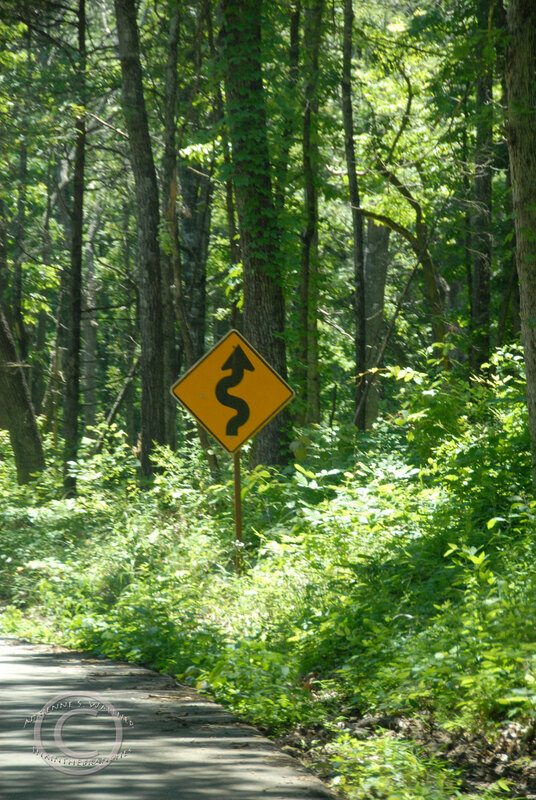 We bumped slowly along the unpaved, tree-flanked road with the windows open, our arms extended into the warmth of the mid-day sun. As unique fascinating as the underground aspects of this National Park are, Mammoth Cave is as enjoyable above ground as below. The cool dark environment of the caves juxtaposed with the lush, sunbathed forest allows visitors an opportunity to explore two completely different ecosystems that seem distant and yet, share a common location. It is a park that showcases biodiversity at its best. When we reached the end of the road, we parked and set our tackle. Packed and ready to pick along the shoreline, we headed into the thick brush of the riverbank. Trees grew up from the pitched slope of the shore, reaching their branches over the rippling water creating a swollen green awning that lined the banks. The sky reflected off the surface, stretching a bright blue stripe down the center of the river. As D and I tried our luck at snagging a fish, we watched a guided canoe trip launch and begin their journey downriver. 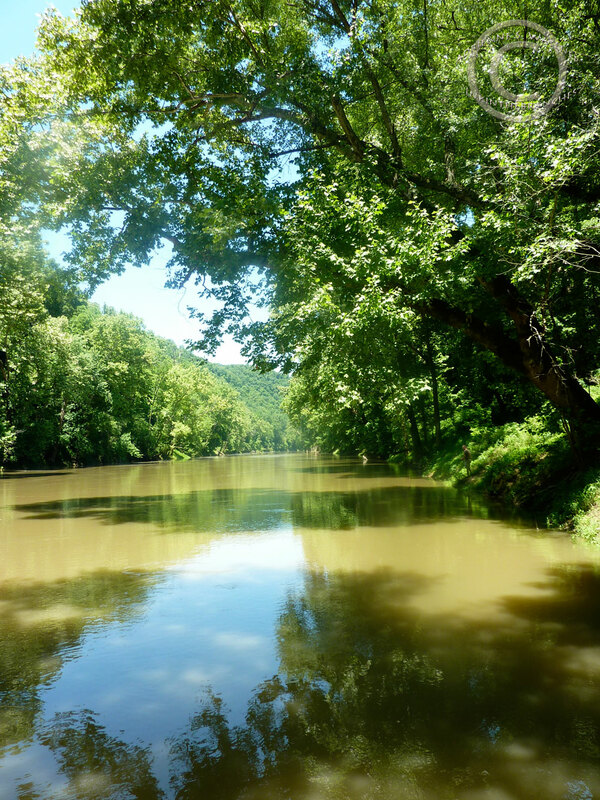 The Green River, Mammoth Cave N.P. 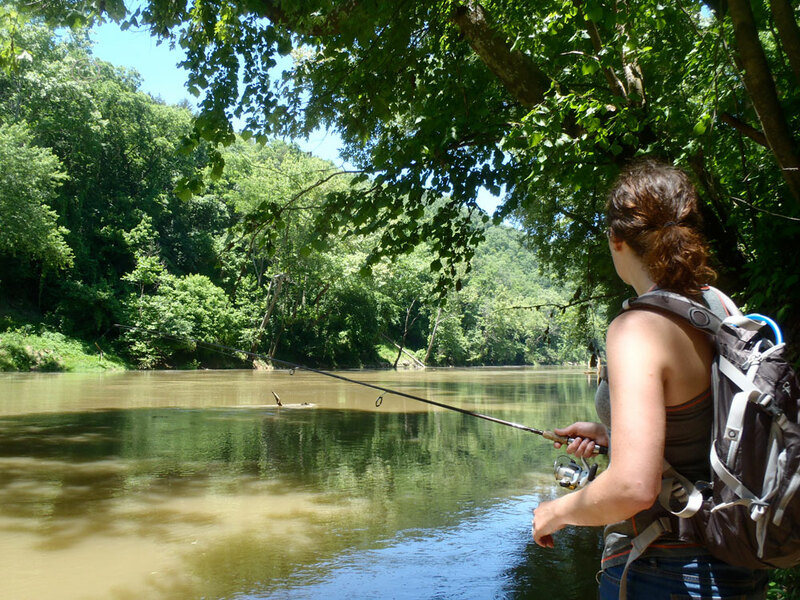 The most commonly caught fish in the Green River are bluegill, bass, crappie, catfish, and muskie. However, we didn’t catch anything but a tan. 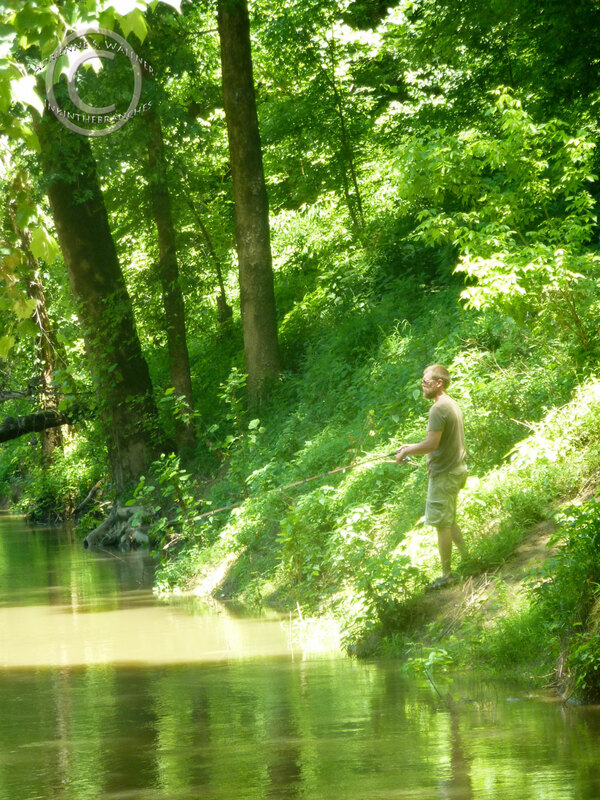 One of the best aspects of fishing though is the fact that it is often just as enjoyable to admire your surroundings while fishing, as it is to actually catch a fish. After a few rounds of “just one more cast” we reeled in and headed back up the bank. Soon, we said goodbye to Mammoth Cave National Park and headed to our next destination: Nashville, TN. 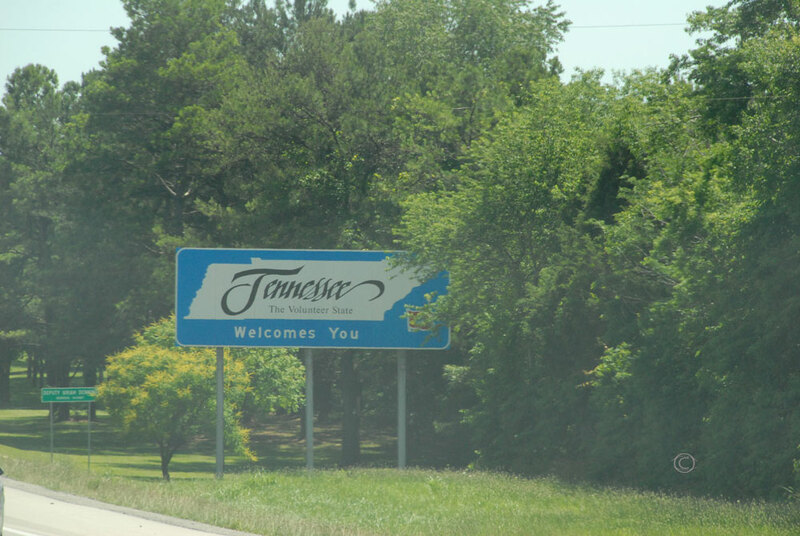 Our true destination for the second leg of this mini-road trip was actually beyond Nashville. Both lovers of camping, music, and obviously travel, Bonnaroo Music and Art Festival in Manchester Tennessee is an annual pilgrimage for us. But first, we planned to stop and visit one of the many places in Nashville for music lovers: Third Man Records, the recording studio of the one and only Jack White. 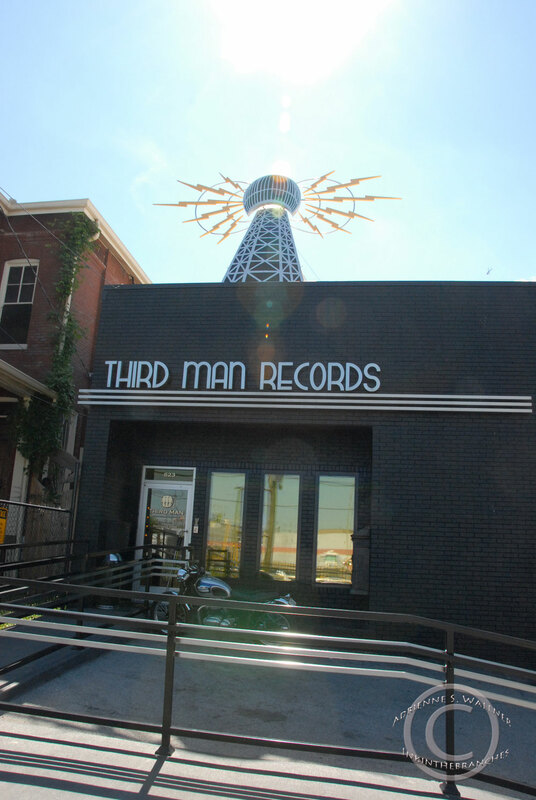 Located off of the bustling main drags of Nashville, Third Man Records almost seems hidden. Anonymous industrial buildings surround line the block, while empty lots and out-of-service railroad tracks peek out from behind metal and barbed wire fences. The subtle brick building could almost go unnoticed were it not for the electrified radio tower emblem emerging from the rooftop. Third Man Records is part of the scene instead of the star of it. This inconspicuous and unpretentious location makes you feel like you have found something special, something secret. We parked up the block a bit and headed to the entrance. D and I are both immense fans of Jack White and his music. Visiting Third Man Records was very exciting for us. Just to know that Jack had been there (and was maybe even there right now) was thrilling. The interior of the shop maintains a red, yellow, and black color scheme, the unusual décor a homage to Jack’s unique style and love of the strange. In addition to a record shop, Third Man Records also has a novelty lounge filled with a variety of coin operated curiosities including a Mold-A-Rama machine that makes small molds of Jack’s 1964 Montgomery Ward Airline Guitar in red wax. Recalling the Mold-A-Rama from childhood visits to the Milwaukee County Zoo and Milwaukee Public Museum with more than a little nostalgia, I of course had to get one. As I thumbed through the vinyl, I glanced up toward the entrance to the shop, about six feet away. When I did I saw a man dressed in all black. Dark hair fell on either side of his face, his pale skin punctuated by piercing hazel eyes. He smiled at me and I smiled back at him. He pushed the door open and walked outside. I pawed at D’s arm. He looked up from the record he was holding, “What?” Unable to say anything or process what had just happened, I grabbed his arm tightly and pulled him toward me. “What? !” he said, “What is it? What’s wrong?” I pulled D to the window and pointed to a dark, slim man just as he rounded the corner and disappeared. “It’s him,” I said. “He was just here.” It took me a few moments to realize it, but I had just exchanged smiles with Jack White. D couldn’t believe it. I couldn’t believe it. There were two or three other people in the shop and they couldn’t believe it either. A girl in a long flowing skirt, bedecked with bracelets stood frozen in the middle of the store whispering “That was amazing. Oh my god, oh my GOD!” under her breath. Chalk up another point for Jack White, music fans! Not only for his incredible music and style, or awesome record store and recording label, but also for the fact that he is willing to give his fans a special thrill, a singular shared moment, just by walking through his door and smiling. Thank you Jack! 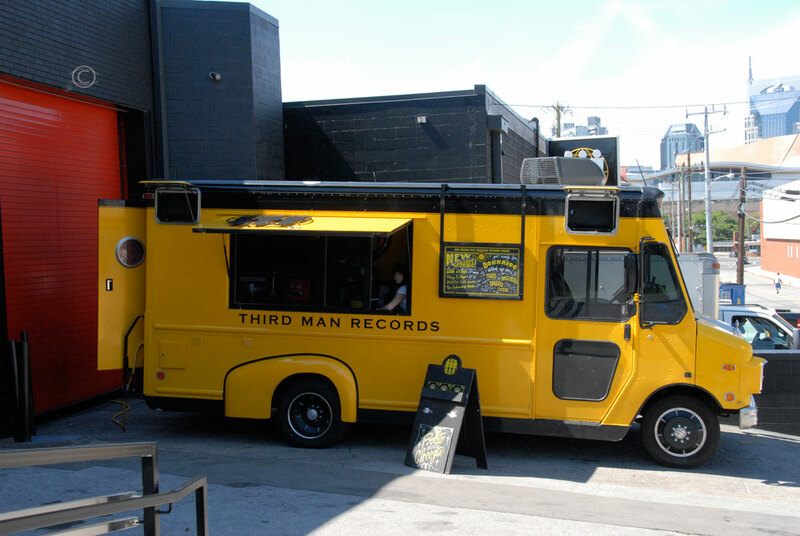 The Mobile Third Man Records parked outside. As you can imagine, I was giddy for the rest of the day. D was happy for me, though understandably disappointed that he didn’t see him in the store. After purchasing some vinyl and a few other items at Third Man Records, we headed out to grab some lunch before we continued on to the Manchester area. We stopped at the Blackstone Brewpub and enjoyed a delicious meal. Red Pepper Artichoke Dip and Hop Jack IPAs followed by the Fiery Flapper Sandwich (grilled chicken, bbq sauce, cheddar cheese and habanero mustard) and the Grilled Fish Sandwich with Tuscan Artichoke Soup. Delicious! We continued south toward Manchester. The Bonnaroo grounds didn’t actually open until the next day, but we planned to camp the night before in Tims Ford State Park. The closer you get to Manchester as Bonnaroo is approaching, the more hopeful music fans you start to see. 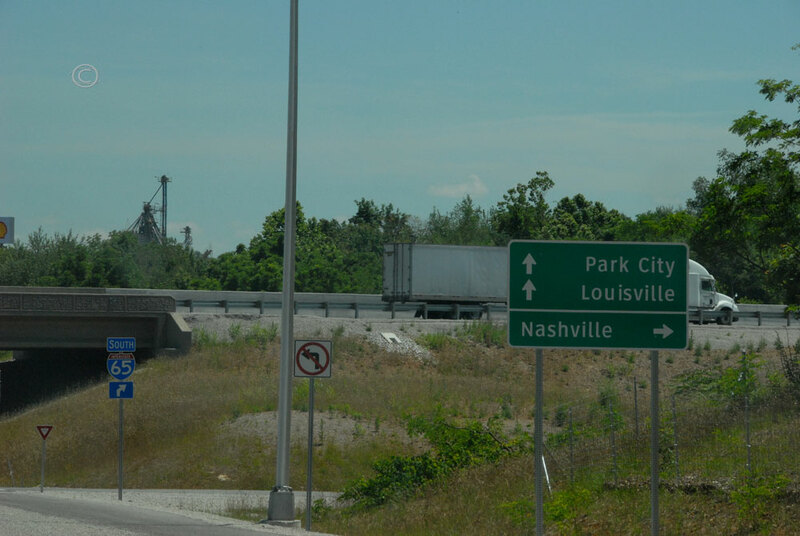 Manchester’s population of about 10,000 explodes to 80,000 and up as the Bonnaroovians descent on the small southern town. 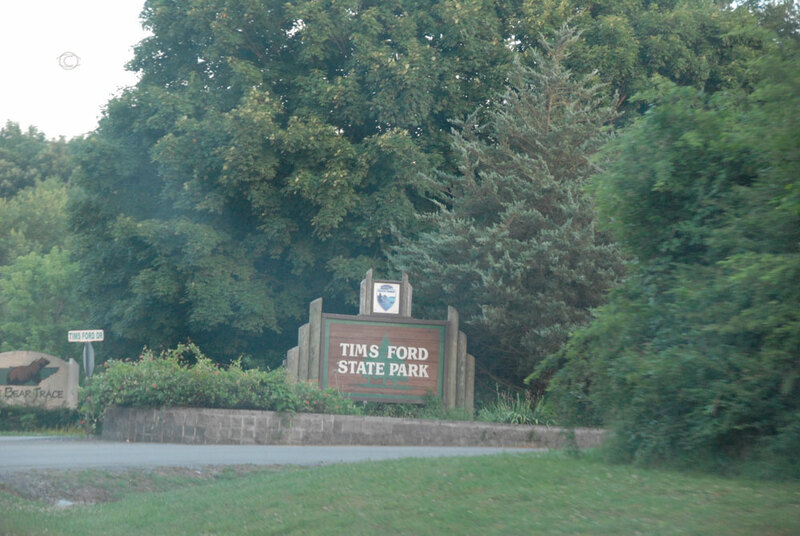 Of the many anxious campers and concert goers we saw, the most entertaining was certainly the school bus sporting a Canadian flag and Ontario plates that we had passed on the highway on our way to Manchester and then somehow ended up following into Tims Ford State Park. We pitched our tent and settled in for our last evening of quiet before we spent four days surrounded by music and dancing. 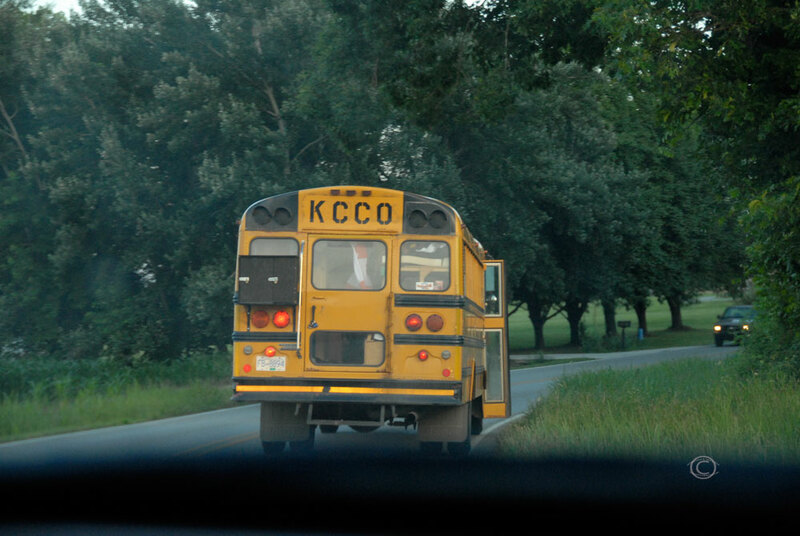 After Bonnaroo, we would head back to Wisconsin until early July and then begin Wanderlust 2013 – 40 Days in Motion. First stop, The Badlands National Park in South Dakota. Stay tuned!